I received an email from a recent art school graduate asking me a number of thoughtful questions about the day-to-day life of being a working artist. I decided the questions and my responses might be interesting to others as well, so rather than restricting my response to an email reply, I’m publishing them here in the form of a quick interview. A: When I started as a painter, I did not stick with similar subject matter – in fact I painted fairly widely; still life, landscape, portrait/figure, even some abstract work. I still love the landscapes that I did, and I think the discipline and rigor of plein air painting has been invaluable to me (and I recommend it strongly to anybody, no matter what type of work you end up doing). I ultimately felt I needed to concentrate on something, though, and my personality tends to the kind of art you can make through still life, so that’s been my almost exclusive focus for the last 7 or 8 years. I don’t consciously worry too much about keeping it fresh and interesting. A composer I know told once me that he values individuality over originality. That’s stuck with me, and I try to ask the question “what’s me?” rather than “what’s new?” I’ve found that by looking for answers to “what’s me?”, the work takes on an authentic life of its own, and evolves naturally and organically. Q: Do you ever paint other things to break up the monotony? A: No, and yes. If things ever feel monotonous in my studio, I know the problem is between my ears, not what’s on the easel. I’m probably doing work that doesn’t answer the “what’s me?” question very well, so I look for adjustments there. That said, every few months I’ll do some landscape or urban sketches, but those are more or less just for my own pleasure. One thing I recently did that is new is begin experimenting with acrylics after many years of exclusively using oils. I found it thrilling to work with a new medium, even though there are a lot of similarities to oil. I enjoy learning about the technical aspects of our craft, and working in acrylic has opened up a whole new window of things for me to study. Q: Do you find that you go through periods of differing motivation/productivity? A: Very much so. However, I was fortunate to spend a decade as a software engineer before becoming a full-time painter, so I have the work discipline as a part of my mindset. I’ve always tried to approach painting the way I did writing software. Painting isn’t just a job, but it is very much a job; any job has aspects that aren’t fun, and sometimes I don’t feel like doing it. But I still do. 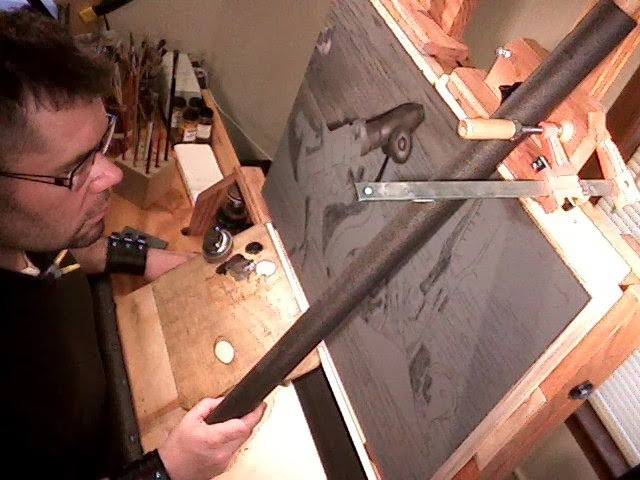 One thing I did several years ago that has been very helpful was to draw up a list of all the different tasks I have to do as part of being a painter; from painting itself to preparing panels to keeping my studio clean and everything in between. I then arranged them according to how much effort and concentration was involved. That way even if I was mindless and lazy place, I could still find something productive to do, even if it was just separating paper towels for my easel. I don’t look at this list often, but it was a very useful exercise for me. Q: What is your average daily working schedule? A: I generally spend about 10 hours a day working. I’m usually in my studio by mid-morning, though I don’t work for 10 straight hours. I have difficulty concentrating on any one thing for more than an hour, so my day is broken up into hour-long periods of work followed by short and sometimes longer breaks, continuing late into the night. Being a working artist also means being a small business-person, so there are many tasks like marketing and bookkeeping that don’t involve a paintbrush. I probably actually paint between 4 and 6 hours a day, depending. For me, it’s important to work 5 days a week, so if I take a weekday off I’ll make it up by working a day on the weekend. Q: Do you ever just literally NOT want to paint? A: Yes – see above – but, it’s the job and life I chose. When I remind myself how incredibly fortunate I am to be able to do it, it’s easy enough to get back to work. Q: Sorry for all the questions, hope you have time to answer at least some of them. A: It was my genuine pleasure, and thank you for your questions. It was very helpful to me to take a step back and have a thoughtful look at my own day-to-day studio life. Now let’s all get back to work! Footnote: I left off any the specifics about the artist who asked these questions before contacting him and getting his approval. He’s since let me know that he’s happy to have his information listed here. He is Ryan Compton, and his website is www.ryancomptonart.com.